Chhotu is 15 years old, but looking at him one would guess him to be nine. His eyes are out of focus, his legs are spindly and too thin for the rest of his body, and his speech is slurred. He should have been out fishing in the deep seas of Ibrahim Hyderi, and earning money. Instead he is a liability who needs to be taken care of, and whose medication costs more than his family can afford. In the same family is a newly born baby girl. Her feet are covered with a reddish rash spreading upwards to her calves, the affected skin peeling. Diagnosed with scabies, the child too is not being treated properly for lack of money. The two children are not a unique case.In the fishing villages along the coastline of Karachi, such as Ibrahim Hyderi, Chashma Goth and Rehri Goth, there are many others, both children and adults, who have been suffering because of the chemicals being dumped in the sea. What should have been a stretch of fishing villages unpolluted by urban waste, seems more like a sewage dump. The coastline is marred by black marshes. And the sea, drawn back many metres, is only a thick mixture of chemicals. Kamal Shah, member of the Pakistan Fisherfolk Forum, explained the problem. These villages are neighbour to Karachi's biggest industrial zone, the Korangi Industrial Area. Landhi Industrial Area is also nearby. "The only beaches which are relatively clean in Karachi are Hawkes Bay, Clifton, Sandspit and the others where the public goes for picnics," he said. "This stretch of the coastline is only used for dumping toxics by factories." The industrial zones are populated by chemical manufacturers, textile mills, tanneries and other factories. These are supposed to treat waste before discharging it into the sea. "Not many follow the rules," said Nasrul Islam Usmani, environmental sciences researcher at the University of Karachi. The chemicals dumped into the sea have also damaged fish and mangroves, he added. 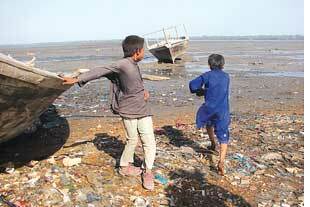 Sindh Environment Protection Agency (sepa), responsible for monitoring industrial waste, admits its failure. "I must say we have not been performing at the level we ought to," said Mir Husain Ali, secretary of sepa. His reasons are usual not enough staff, no court dealing with environmental issues for a long time. His assurances are predictable--"We have recently served 100 notices to factories in Karachi." The waste also comes from the city's residential areas. Every day trucks from Karachi and Clifton cantonments head to the 190 square metre patch between Ibrahim Hyderi and Rehri Goth to leave the city's garbage there. Ajab Khan, the sanitation inspector at the Clifton Cantonment Board that governs the cantonment, said the board has given the task of waste disposal to contractors who are supposed to dump it at Jam Chakro outside Karachi. But Jam Chakro lies in the direction opposite to the coast. Some in the village allege that dumping is nothing but a step towards forcing the sea to recede and yield land. "The Jamots, the feudal family in the area, have been paying contractors from the two cantonment boards to dump the rubbish here so that eventually the sea is forced back and they can take over the new land," said one of the residents requesting not to be named. The Jamots deny this. "I have made several complaints to the Town Police Officer. People are arrested but soon it is back to square one," said Jan-e-Alam Jamot, nazim (mayor) of Bin Qasim town, within whose jurisdiction lie the fishing villages. Asked why he did not deploy the police to stop illegal dumping, the mayor said, "Good idea. Perhaps I will try it in future." So tankers and trucks continue to disgorge Karachi's waste at the villages. Diarrhoea, scabies and other skin and gastric diseases are common in the villages, said Rajesh Kumar, physician in charge of the Aga Khan Medical Centre for Infants in the town. "Water here has an excess of minerals. This causes mental retardation. There are many handicapped children, and all pregnancies are high risk." Aga Khan's is one of the very few medical centres in the area. Near the marshy shore ragpickers from the villages rummage through the garbage, exposing themselves to chest infection and laceration. Unwanted pile of rubbish burns, billowing thick, grey fumes. It is difficult to breathe. But children carry on with making piles of the freshly dumped garbage or chatting among themselves. How could they go about with their work in the fumes with such ease? "We are the people of Sindh, brave and strong. We are made of stone, nothing can affect us," shouted a little boy. Irony hung in the air for a while along with the soot.